Overlooked by heavily wooded Sandford Hill, the residential village of Sandford lies to the north of the Parish. Built in 1881 at Sandford crossroads as a Chapel of Ease is the Church of All Saints. This Church is, once again, associated with Winscombe's Church of St.James. The Methodist Church, opened during the Centenary Celebrations of 1900, stands on Hill Road and is built mainly of Draycott Stone. The earlier Wesley Chapel, first recorded in 1803, and nearby, is used as a church hall and called "The School Room". The agrian-based economy of Sandford has long gone, as have most of the farms. However, several farm houses remain. "Myrtle Farm" has been the Sandford home of Thatchers Cider for over a hundred years. With its modern production facilities, this is one of the most advanced cider makers in the industry. The ciders are allowed to mature traditionally in oak vats to provide a variety of products with wonderful tastes and often "apple" names. 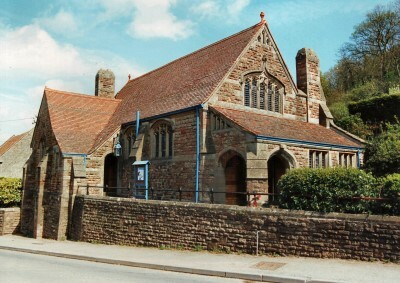 The Village Hall in Sandford is a major centre of activity. Built on a plot of land donated in 1909 and originally used as a reading room, it has undergone, over the last few years, a programme of much improvement, supportd by Lottery funds, the Parish Council and local businesses. Under the supervision of the Trustees and responsible to the Charity Commissioners, it is run to provide a venue for meetings and clubs that cover all ages from young children to retired people. Interesting programmes are provided for those in the village and beyond. Besides this, the programmes create enjoyable social occasions and generate much-needed funds to help keep the Hall bright and attractive. The former railway line now exists in little more than memory. In 1970 the Sandford and Banwell Station was taken over by a company called Sandford Stone. This company has now been sold but the staion master's house, engine shed, platform and platform buildings remain and have been preserved. Only the future will tell what is to happen to this important site. More immediately, substantial and attractive extensions have been made to the village primary school. Youngsters will surely continue to relish their studies at the school. In addition, when not in school, they could find additional exercise at the Play Area in Winnowing End. Seemingly bitten out of the western end of Sandford Hill is a disused quarry and nearby are disused limekilns. The area was served by a series of railway tracks that, in joining the quarry to the main railway line, passed across the main road between Sandford and Winscombe. Part of Sandford Hill is described as The Award Land and more details of this can be found elsewhere on this site. To the east end of the hill is The Action Centre. There, activities include the use of a dry ski slope of over 150 yards in length that winds down through the wooded hillside. the hill has some delightful walking but do beware of the quarry! While walking you could see the remnants of former mining operations, though this is not unusual as several areas in and around the parish show results of mining. The associated spoil heaps are called "gruffy" ground by locals. Look out for these areas: they have a peculiar, pock-marked appearance. The ores extracted can be used for various purposes, including the production of metals such as iron, lead and zinc. For more walking you should look on the map for Nye Road. If you travel on well down this road and over a bridge you will see on the right, a permissive path that joins Nye Road to Cheddar Valley Railway Walk. Further on along Nye Road and on to the right is Nye Farm, a moated farm. The Countryside here has many attractions. Watch out for buzzards! The views stretch in all directions: Wavering Down can just be seen when looking south through the gap between Banwell Hill and Sandford Hill. To share in the Jubilee celebrations, Sandford villagers raised money for the production and installation of several stone, village signs. They will be in position for very any years.